If you can get yourself to London, you can enjoy a Bloomsbury Evening sponsored by the Virginia Woolf Society of Great Britain on Thursday, April 11, at 7 p.m. at the NOW Gallery in London. 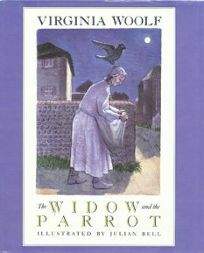 Maggie Humm will present a salon discussion plus a reading on Virginia Woolf’s story for children, The Widow and The Parrot, with illustrations by her nephew, Julian Bell. Adults and children of all ages are welcome to relax on the cozy rug in Studio Morrison’s enchanted children’s library under the huge glowing helium balloon. Tickets: Are available until March 10, are priced at £3.79, and are available online. All proceeds go to the charity Book Trust. Directions: NOW Gallery is next door to North Greenwich tube on the Jubilee Line, 15 minutes from Green Park. Exit the tube station and the circular glass building is Gateway Pavilion: NOW Gallery is in this building opposite CRAFT London. 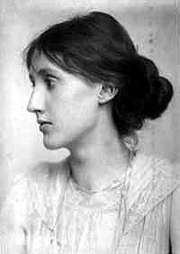 If you are lucky enough to be one of the 98 who will attend the Jan. 26 sold-out Virginia Woolf Birthday Lecture, sponsored by the Virginia Woolf Society of Great Britain, please note that the location for the talk, titled “Virginia Woolf’s Non-Literary Reputation,” has changed. The new location is Birkbeck, room MAL B20 at Birkbeck’s Malet Street campus. The entrance is round the back from Malet Street, in Torrington Square, WC1E 7HX. Doors will open at 1:30 p.m. and the lecture is at 2 p.m.
Organizers advise that you allow a good ten minutes to find the lecture theatre, which is in the basement B20. Members of the Executive Council to guide attendees and signs. You can also review the map (the Main building is number 1 on the map). Immediately following the lecture from 3.30 p.m., the Reception (drinks, cake, raffle and book stall) will take place in the dining-room of the Tavistock Hotel at 48-55 Tavistock Square WC1H 9EH. The hotel has generously provided their services. The late change of venue is due to the society’s support of the boycott of University of London administrative spaces, specifically Senate House, which academic and professional associations are supporting. 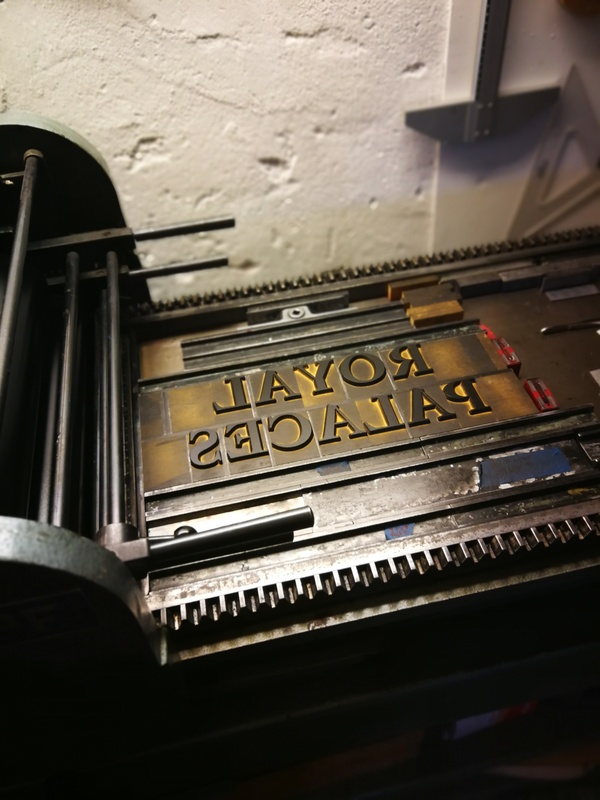 In 2017, Ane Thon Knutsen combined her love of Virginia Woolf and her love of typesetting with her project A Printing Press of One’s Own. 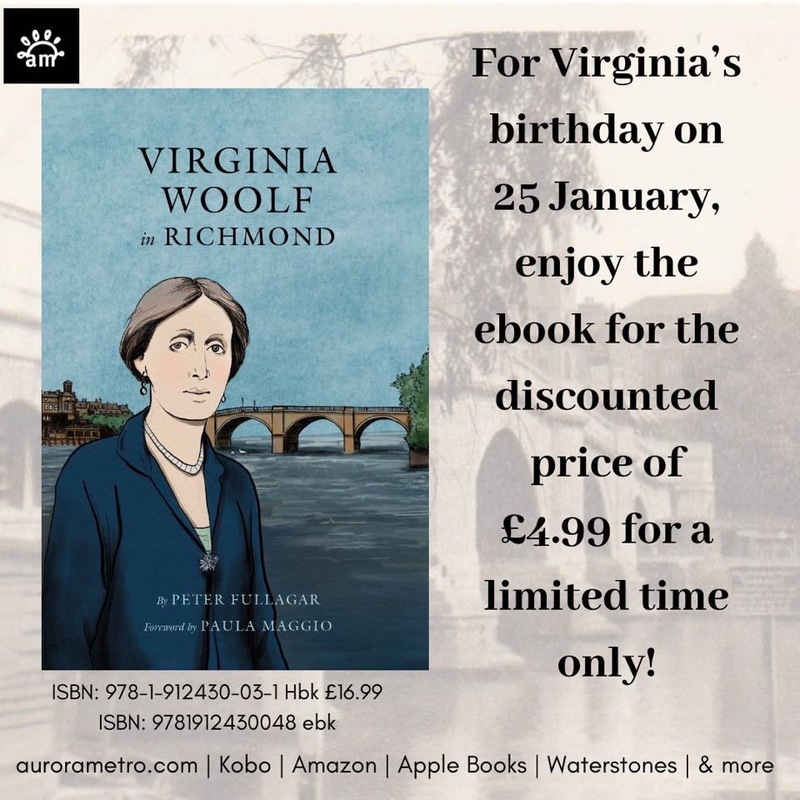 The two came together in her hand-set volume by the same name, which she debuted at the 27th Annual International Conference on Virginia Woolf at the University of Reading that June. 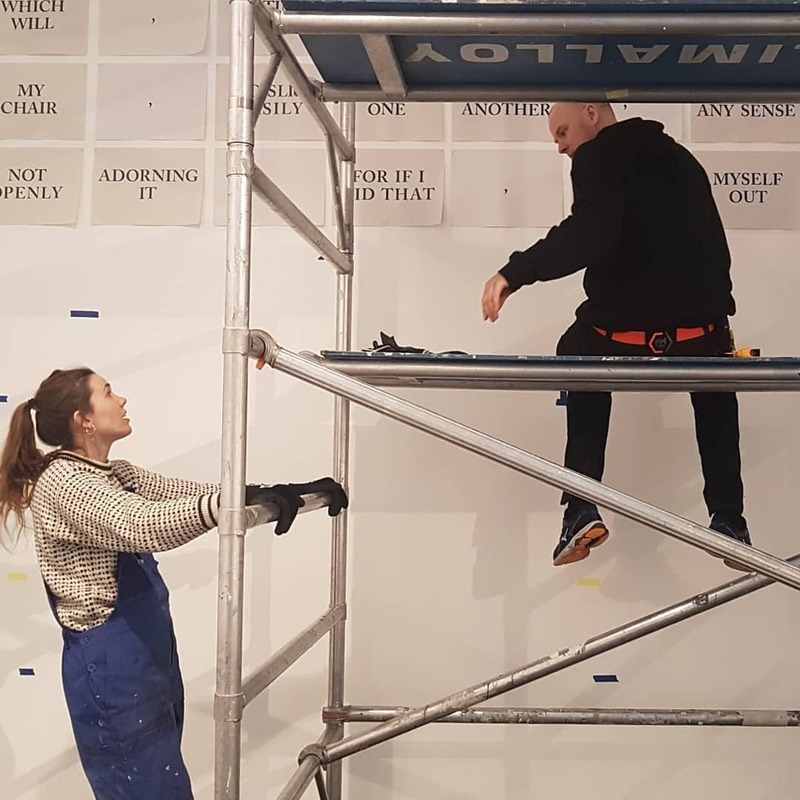 Now she’s at it again, this time with a massive installation titled “The Mark on the Wall,” which runs Jan. 22 – Jan. 27 at Kunstnernes Hus, Oslo. 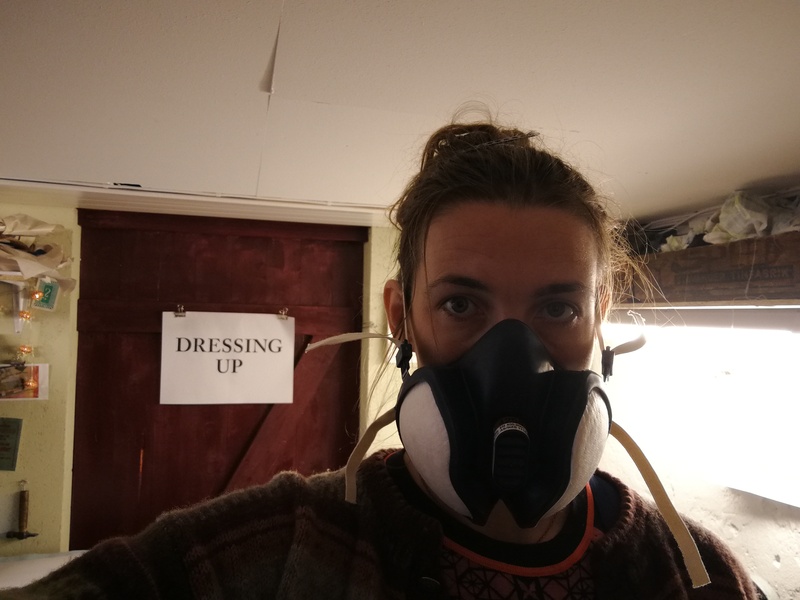 The free exhibition is a part of Artistic Research Week 2019. In this practice based PhD. Ane Thon Knutsen reflects on how the material process of typesetting colours the way one thinks about words and the physical materials of literature, from within the practice of typesetting itself. The results of this research will be presented as a massive installation, an adaptation of Virginia Woolf’s “The Mark on The Wall” (1917). “The Mark on the Wall” is the first story Woolf wrote whilst teaching her self to typeset. The prints will all appear in one installation, filling a huge room. Knutsen’s adaptions of this short story represents a new way of reading Woolf as a typesetting author. Knutsen reflects on and lives out how thoughts materialize in the world, in a pendular process between the mind and the body. In this installation Knutsen is translating the story from the pages of the book to a room of one´s own. Knutsen will also be showing previous adaptions of “The Mark on The Wall” simultaneously at Oslo National Academy of The Arts. Ane Thon Knutsen (b.1984) is a designer & artist living and working in Oslo, Norway. 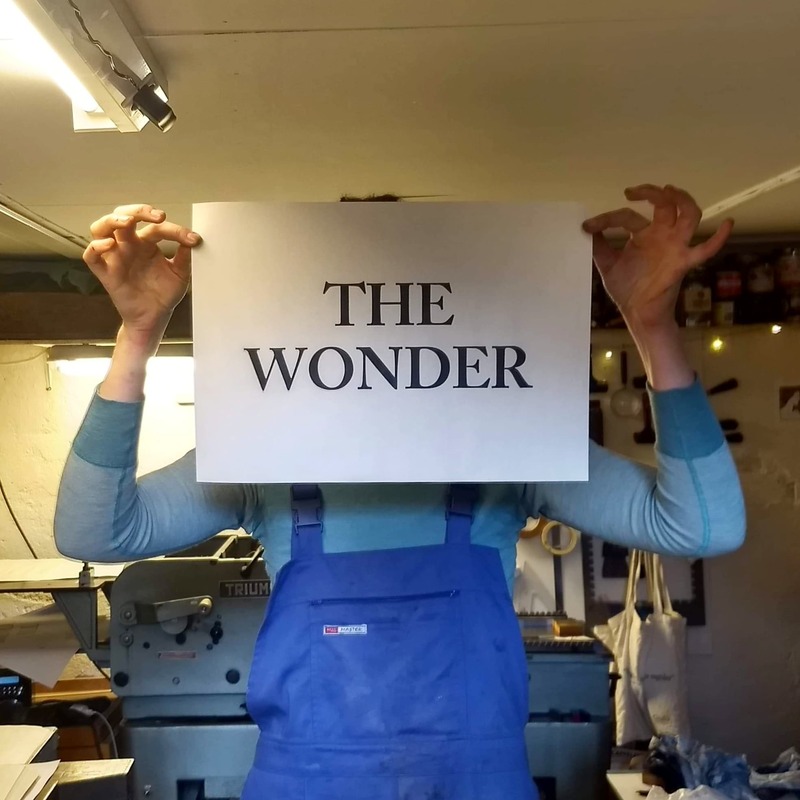 She specialized in letterpress printing and her artistic practice can be placed in-between graphic design, conceptual letterpress printing and performative presentations. Ane is currently a PhD- candidate in Graphic Design at Oslo National Academy of The Arts. 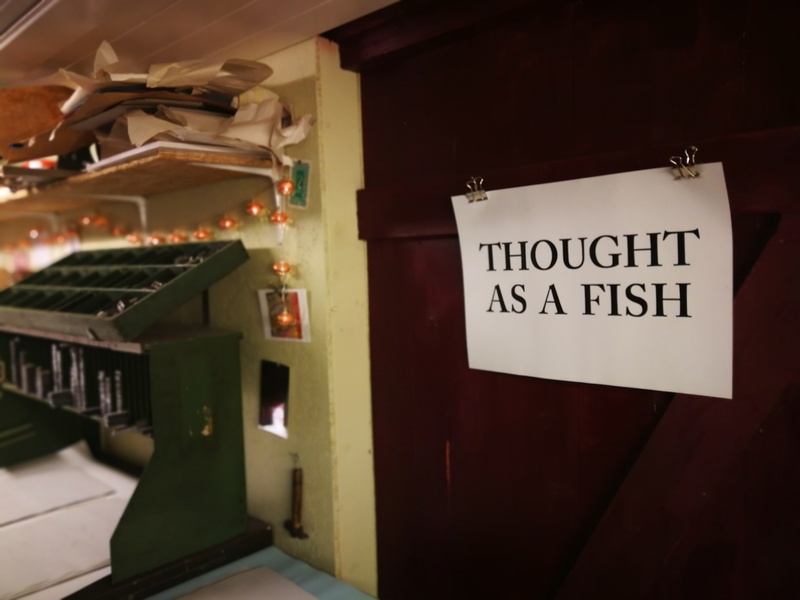 In the project A Printing Press of One´s Own, she is researching Virginia Woolf’s practice as a self taught typesetter and publisher through experimental graphic interpretations of the short story “The Mark on the Wall” (1917). Below are photos of her work on the exhibit that Ane shared with Blogging Woolf. “900 massive meters of prints are up!” is the comment Ane included with this photo on her Facebook page on Jan. 18. 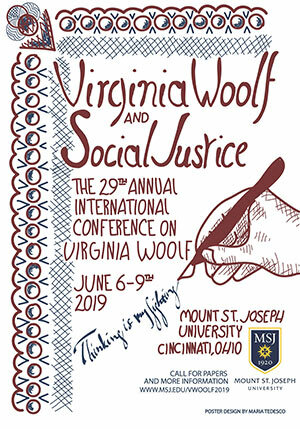 Woolf in the #MeToo era, Woolf and theater, and Woolf and inclusivity are among the topics that will be covered at the 29th Annual International Conference on Virginia Woolf, with its theme of Woolf and Social Justice, at Mount St. Joseph University in Cincinnati, Ohio, June 6-9. Ellen McLaughlin (Actor “Angels in America,” among many others], Director, Playwright “Septimus and Clarissa,” “A Narrow Bed,” among others) on Woolf, Theater, and Activism. The June 6 evening celebration will be at the historic Taft Art Museum in downtown Cincinnati, a Greek revival, National Historic Landmark building that originally served as the home of the Taft family (and from which William Howard Taft accepted his presidential nomination in 1908). The museum will be closed to the public and attendees will be able to peruse the collection and the garden at their leisure. June 7 will feature a performance of Leonard Woolf’s play “The Hotel,” featuring students and faculty from the Mount and supervised by McLaughlin. An all-conference roundtable event will conclude the conference on Sunday morning, June 9, to be followed by a visit to the National Underground Railroad Freedom Center in downtown Cincinnati, a museum commemorating Cincinnati’s historic location as the border between North and South, and the place to which escaped slaves fled to their freedom. Deadline for the call for papers is Jan. 31.